The Marisy family acquired in 1486 a half-timbered house that was reduced to ashes by the great fire of 1524. Mayor of Troyes from 1522 to 1528, Claude de Marisy, had it rebuilt in stone and added an elegant Renaissance corner turret. The hôtel bears the family arms, including that of his wife, Michelle Molé, who was from a renowned local family. The façade on the rue Charbonnet has a coach door with pilasters topped by a triple window. Spanish-style iron work, with hammered and twisted bars, protects the bay window. On the side of the rue des Quinze-Vingts, visitors admire the broad Renaissance fireplaces and the multi-colour lozenges on the roof made of glazed tiles. 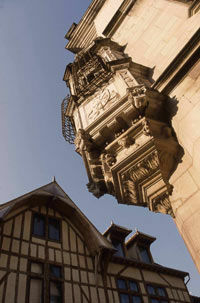 The building was restored in 1872 by the architect Eugène Millet, a disciple of Viollet le Duc.